Acktar is a world leader in high absorptance & high emissivity black coatings for stray light suppression in high performance optics. The combination of a very low reflectance, high thermal stability, excellent adhesion, and low outgassing in a coating that is only a few microns thick is very unique. Acktar black coating services are suitable for essentially all engineering materials and is probably the best component coating services provider you may find. The only absorber coating solution that may really call it self compatible with metals, alloys, polymers, silicon, glass, and ceramics. Our black coating services are focused at your specific requirements, be it an infra red coating or an alternative to light absorbing black paint for your special components, a specific wavelength or application, as well as tailored black coating on steel, glass, silicone or any other material. Acktar’s proprietary sophisticated vacuum deposition (vacuum coating) technology generates coatings with an extremely high specific surface area. Question: How do Acktar’s black coatings compare with typical paint coatings? Answer: Acktar’s black coatings are manufactured using vacuum deposition technology. They are very thin, completely inorganic, have very low outgassing and low reflectivity. See our video here. The table below provides a detailed comparison of Acktar’s black coatings with typical paint coatings. Question: What is the typical thickness of Acktar’s coatings? Answer: Acktar’s black coatings are typically between 3-14 µm thick, but can be tailored to between 1-30µm upon request. Question: What makes Acktar’s coatings the best choice for IR detectors and Space applications? Answer: No Particulation, broad working temperature range, low outgassing, thin coating with tight tolerances, low reflectivity over a wide wavelength range, high emissivity, completely inorganic, can be applied on essentially any substrate, perfect cover (no build-up) on edges. Question: Can you coat selected areas on the part? Answer: Yes, easily! We use mechanical masking that is tailored to the requirements of the coating area. Question: What would be considered as a typical applications for the black coatings? Answer: The most common applications are: stray light absorption in UV-VIS-IR wavelengths, night vision systems, cooled Infrared detector parts, satellite parts, high surface area capacitor electrodes, LED screens and more. Question: What Quality standards do you comply with? Answer: Acktar is certified as a production and development facility by ISO 9001:2000, IQNet, S.A.M.S, RoHs and REACH. In addition we are certified as a “Ship to Stock” supplier for one of the world’s largest manufacturers of IR detectors – based on our quality and strict inspection regime. See the full list of certificates. Question: How can I coat large area parts / surfaces? Direct Black Coating (current page) – where you send the part to us and we coat to your specifications. Foils and Films – Black coated foils and films with or without adhesive that can coat large areas. Question: What is the coating thickness tolerance? 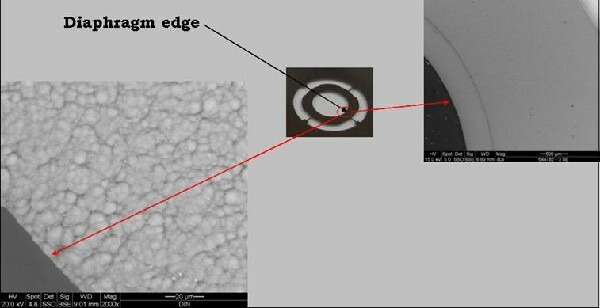 Answer: The thickness tolerance of our black coatings can be as tight as 1-2 µm. Question: What is the quality of the black coatings on the edges? Answer: Our coatings have excellent coverage over the entire part including the ability to confirm to edges as seen in the below photo. There is no need for special design of the edge to attain the perfect coverage. Question: How do Acktar Black coatings perform in extremely low temperatures? Answer: Acktar’s Fractal BlackTM was tested by an independent laboratory to compare its performance at very low temperatures with that of thick epoxy layers and black paint. A full copy of the report is available upon request. Question: Most of your black coatings have very high emissivity. Can you produce a coating which is black in the visible range, but has low emissivity in IR? 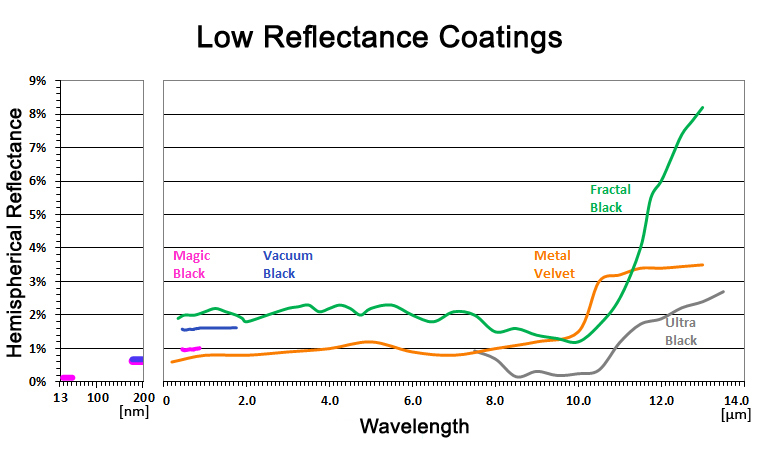 Answer: Yes, our Nano Black selective coating has high absorbance in the VIS range and low emissivity in the IR range.